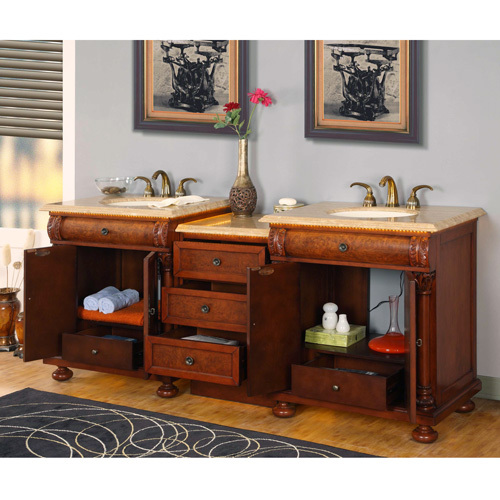 The Floresta Double Vanity offers a look that will truly shine in any master bedroom. LED lights are located underneath the Roman Vein-Cut Travertine top. This produces a tranquil glow that is achieved without using harsh lighting. Two ivory ceramic undermount sinks are also included. The finish is hand painted, and the regal side columns are hand carved. 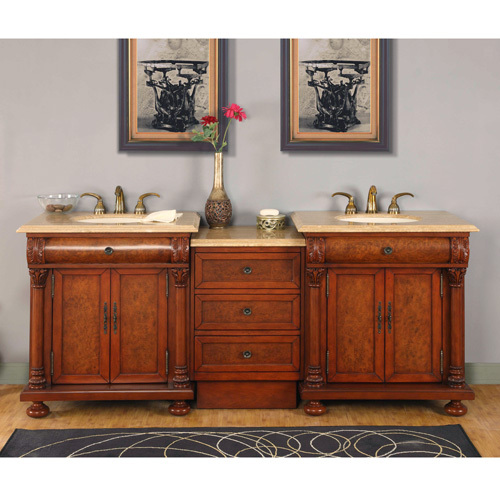 The vanity also features five drawers and two doubledoor cabinets. A drawer bank adds an additional three drawers. The matching drawer bank features the same finish, counter top, and lighting as the main vanity. Faucets are sold separately. If you have always wanted something different for your bathroom, an LED vanity makes an excellent conversation piece. These vanities feature an array of LEDs underneath the countertop. The natural stone top is capable of refracting the light from LEDs to give off a calming, romantic glow. The color of the light changes as it passes through the stone. LEDs are low voltage and efficient, making them ideal for vanity installation. A power adapter, compatible with standard household outlets, is included to provide power to the LEDs.